The fund manager is Michael Perre. It has a low expense fee of 0.15%. The current dividend yield is 2.84%. The share price is valued at $41.50. This popular ETF has big assets of $46 billion. You can buy this ETF through your brokerage such as Vanguard, TD Ameritrade, etc. 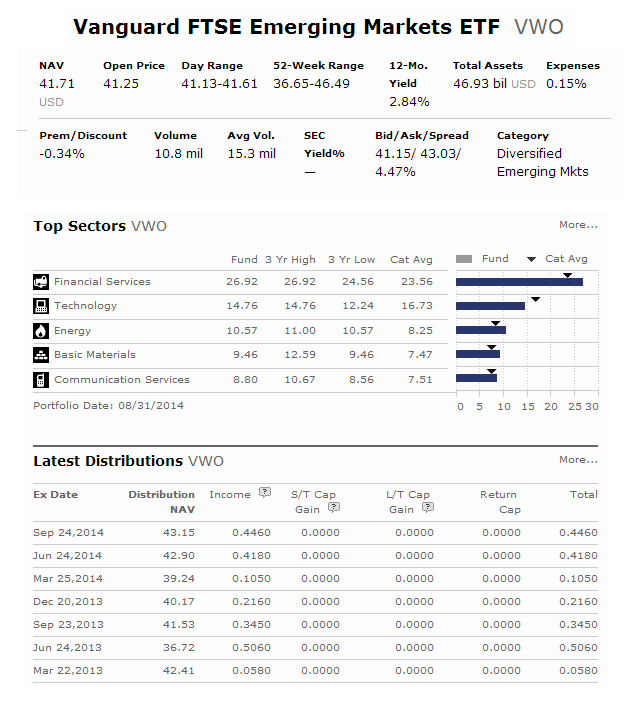 The fund advisor is Vanguard Equity Investment Group. If you are interested in investing in mutual fund, you can invest in these other classes. The other classes are admiral shares (VEMAX), and investor shares (VEIEX). This fund has 962 stocks in its portfolio. The top 5 stocks are Taiwan Semiconductor Manufacturing Co. Ltd., Petroleo Brasileiro SA, Tencent Holdings Ltd., China Mobile Ltd., and Itau Unibanco Holding SA. Top 6 countries in its assets are China, Brazil, Taiwan, India, South Africa, and Mexico. The investment risks are stock market risk, country risk, emerging markets risk, currency risk, and other investment risks. This Vanguard FTSE Emerging Markets ETF has a low expense fee.